Welcome to Westover Composite Squardron MA-015's Aerospace Education page! Welcome to the electronic bulletin board for the Westover Composite Squadron of the Civil Air Patrol! Here is where you'll find all the up-to-date information on current events in aerospace, aviation, weather, astronomy as well as current and past squadron activities. Aerospace Education is one of the principle functions of the Civil Air Patrol. Hope you enjoy and learn something. to take place this July. settle down elsewhere at night. (about 6,000 miles). It would be powered by a combination of solar power and fuel cells. having fun with CHP at that point). No word on what speed the F-16 was clocked at. project recorded barking sounds as it’s flying. the caller through how to use it). have to first travel to a black hole (about 5-50 times the black hole’s diameter away from it). NASA Wallops Island launch facility. Its mission is to bring supplies to the ISS. Yet again, we wish to specially Thank Lt. Colonel ShellEy Rosenbaum-Lipman for her help aid and assistance. Radio signals coming from deep space. The bevy of high-speed flashes came from 1.5 billion light-years away, and they include one exceedingly rare repeating burst. Astronomers have detected 13 high-speed bursts of radio waves coming from deep space—including one that regularly repeats. While the exact sources remain unknown, the new bevy of mysterious blasts does offer fresh clues to where and why such flashes appear across the cosmos. Since these bursts were discovered in 2007, their cause has remained a puzzle. Based on estimations of the known range of their frequencies and an understanding of activity in the universe, scientists expect that nearly a thousand of them happen every day. But to date, only a handful have been found. Now, a team using the Canadian Hydrogen Intensity Mapping Experiment, or CHIME, has announced the additional 13 new detections, including an especially rare repeating burst. Until now, only one other repeating fast radio burst was known to exist. “The repeater,” as it being called, and its 12 counterparts came from a region of space some 1.5 billion light-years away, the team reports today in the journal Nature. All 13 new bursts have the lowest radio frequency yet detected, but they were also brighter than previously seen fast radio bursts, leading the team to think the low frequency has something to do with the sources’ environment. For instance, the radio waves get twisted as they travel through space and can scatter or be absorbed by gas and plasma. The team therefore thinks that all 13 bursts likely originated from dense, turbulent regions inside of their host galaxies, particularly areas with a lot of violent activity, such as near dense supernova remnants or close to black holes. Tendulkar and the team also noticed that the structure of the new repeating burst is strikingly similar to the only other repeater ever found. “The fact that we see these multiple structures in the burst was very similar to the first repeating fast radio burst. This is very uncommon,” he says. “Now there is this tantalizing evidence that these bursts’ structures are seen only in repeaters.” That suggests that if more fast radio bursts are found with that structure, they may be prime candidates for also being repeaters. The new repeating burst is brighter than the previous detection, which might be due to the fact that it is 1.5 billion light-years closer, but the team can’t know that for sure. To draw more comparisons, they’ll have to search the skies for the new burst’s host galaxy, which is not a guaranteed find. In the meantime, the team is continuing to use CHIME to observe the region of the sky where these bursts came from, as well as using other radio telescopes to follow up on the finds. What’s more, when CHIME detected these new bursts, it was only running at a fraction of its capacity, and the team is excited to see how many more will appear in their data now that the instrument is fully up and running. Finding yet more bursts means that the odd occurrences could be effective tools for understanding the traces of gas, dust, and plasma that exist in the seemingly empty space between galaxies, called the intergalactic medium, Chatterjee adds. And for now, Tendulkar notes that the mystery surrounding fast radio bursts remains part of their appeal. Thank you to Lt Colonel Shelley Lipman for you input and ideas and events. Looking for something different? 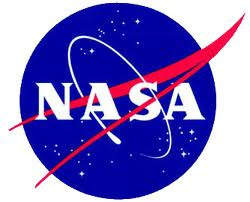 Check out NASA's A-Z list of education opportunities that NASA offers throughout the year. Want to Talk to an Astronaut on the International Space Station? Amateur Radio on the International Space Station (ARISS) contacts allow education audiences to learn firsthand from astronauts what it is like to work and live in space. These scheduled contact opportunities are offered to formal and informal education institutions and organizations, individually or working together. The radio contacts are approximately 10 minutes in length due to the radio communication window permitted by the logistics of orbital passes of the ISS. During the contact, students interact directly with astronauts and cosmonauts during this communication window using a question and answer format. Do you know a deserving K-12 Classroom teacher that deserves to be recognized? Honor a K-12 classroom teacher for the work they do to support the American Institute of Aeronautics and Astronautics (AIAA) in its efforts to bring "real world" STEM (Science, Technology, Engineering, and Math) to the classroom in new and exciting ways. Nominate teachers who excite and engage students through STEM content and experiences. Through this recognition, AIAA celebrates the "best and brightest" educators for inspiring students. Each award recipient will be honored at the AIAA Aerospace Spotlight Awards Gala. A nominee may be any K-12 teacher who supports AIAA in its efforts to bring "real world" STEM experiences to students. Past recipients may not apply for this award a second time. All recipients must be or become an AIAA Educator Associate member. Preference will be given to educators who demonstrate active participation and use of AIAA resources in their classroom. Questions? Contact Carol Stewart at carols@aiaa.org or 703.264-7623. Subscribe to the NCASE Monthly Newsletter and find out what thousands of young people and educators are doing! Rocketry is one of the most enjoyable projects 4-H has to offer. 4-H and the National Association of Rocketry have formed a partnershipto help students learn about model rocketry and STEM. Delaware County 4-H, for example, provides Rocketry School Enrichment and After School Enrichment Programs that help students meet Pennsylvania Academic Standards in science. 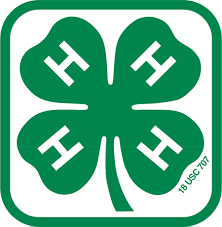 4-H project books are available for Delaware County, Pennsylvania classroom teachers, home school families, and after school clubs to use with students. CAP educational programs (for its own members and the general public) help prepare American citizens to meet the challenges of a sophisticated aerospace society and understand its related issues. CAP and the national Association of rocketry have formed a partnership to help students learn about model rocketry and STEM. CAP offers national standards-based educational products, including a secondary textbook, Aerospace: The Journey of Flight, and the middle-school-level Aerospace Dimensions. Aerospace Education Members can get classroom materials and lesson plans from CAP. It's spring...the prime time for model rocketry at schools! Estes Educator works with many educators daily, getting lots of calls and emails from teachers and youth group leaders who have never built and launched a model rocket but who want to do that with their students. Can you guess the two questions first-time rocketry teachers ask the most? They are "How do I get started teaching model rocketry?" and "What materials do I need to teach model rocketry?" These questions can be answered in 13 steps. And don't forget to check out their new downloadable iPhone app! Help NASA Find New Planetary Systems -- Become a Disk Detective! Help NASA find new disks, homes of extrasolar planets, by classifying images from NASA's Wide-field Infrared Survey Explorer telescope and other observatories. In this citizen science project, you'll view animated images of disk candidates and classify them, distinguishing good candidates from galaxies, asteroids and image artifacts. NASA's Education Materials Finder will help teachers locate resources that can be used in the classroom. Users may search by keywords, grade level, product type and subject. With hundreds of publications and Web sites indexed, the finder is the best way to locate NASA educational resources. This guide contains 25 activities designed for 4-H Clubs, Boys and Girls Clubs, Boy Scouts, Girl Scouts, after-school programs, and other informal education venues. Participants learn about the history and principles of rocketry and NASA's newest rockets -- Ares I and Ares V. While doing these hands-on activities, participants also learn about Hero Engines, parachutes and surface area, altitude tracking, and Newton's Laws Of Motion. Learners can also build four types of rockets and two types of egg drops. Take a look at the Adventures in Rocket Science Guide! NASA and the Marshall Space Flight Center strive to help maintain a strong American education system. They pursue this goal by nurturing students' interest in mathematics and science from elementary school through their college years, and by encouraging young people to consider careers in engineering and the aerospace industry. Browse the Marshall Space Flight Center Education Page! States. Check these out and see if any match what you had in mind for your course! April 2, 1915: President Woodrow Wilson appointed the first 12 members of the National Advisory Committee for Aeronautics (NACA). Twenty one days later, on April 23, the Secretary of War called the first meeting in his office. Brig. Gen. George P. Scriven, Chief Signal Officer, was elected temporary chairman, and Dr. Charles D. Walcott, secretary of the Smithsonian Institution, was elected first chairman of the NACA Executive Committee. April 4, 1930: David Lasser, G. Edward Pendray, Fletcher Pratt and nine others founded The American Interplanetary Society, later the American Rocket Society (ARS), in New York City to promote interest in and work toward interplanetary expeditions and travel. April 1, 1945: The U.S. Army fired the first of 17 Jet Propulsion Laboratory Private F rockets at Hueco Range at Fort Bliss, Texas as part of its historic Ordnance/CIT ballistic rocket program. April 4, 1960: Frank D. Drake initiated Project Ozma using the 85-foot Howard E. Tatel Radio Telescope at the National Radio Astronomy Observatory at Green Bank, W. Va. It was the first systematic attempt to detect artificial radio signal patterns from nearby stars. After 150 hours of listening, the project returned no evidence. However, Project Ozma was the precursor for many more, increasingly sophisticated searches which continue today. April 6, 1965: The United States launched Intelsat I, the first commercial communications satellite, into geostationary orbit. Also called "Early Bird," the satellite provided the first scheduled transoceanic television service and was operational for 3.5 years. 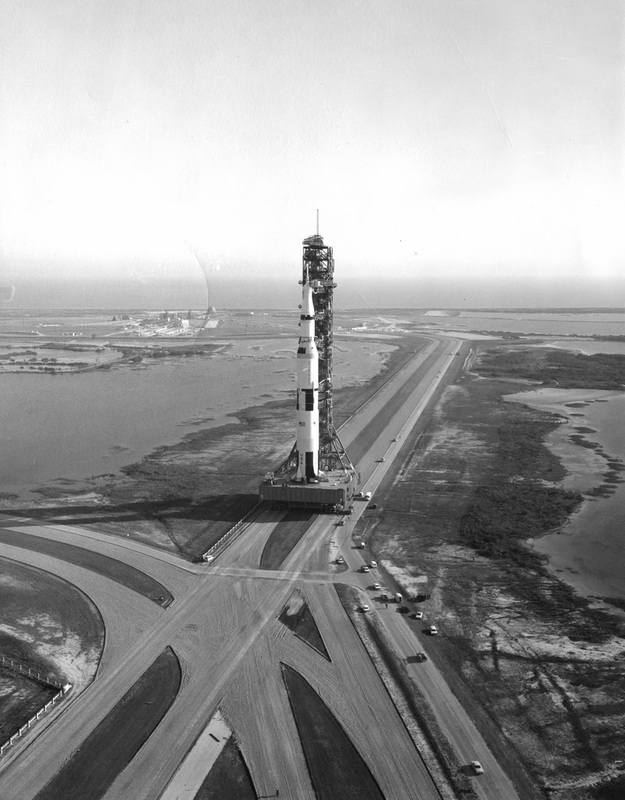 ground and the Apollo crew worked together to find a way safely home. Astronauts Jim Lovell, Fred Haise and Jack Swigert used the lunar module as a lifeboat before returning to the control module for reentry. After a dramatic period of innovative recalculation at Mission Control Center at NASA's Kennedy Space Center inHouston, Texas, the crew returned safely six days later. April 26, 1980: The U.S. Department of Defense launched the NavStar 6 navigation satellite via Atlas F rocket from Vandenberg Air Force Base in California. The NavStar Global Positioning System (GPS) is a radio-positioning system of satellites that provides navigation and timing information to military and civilian users across the globe. April 29, 1985: NASA launched the space shuttle Challenger (STS-51B) from Kennedy Space Center, Fla. It was the first operational flight for the Spacelab orbital laboratory series developed by the European Space Agency (ESA). The orbiter made its first crosswind landing at Edwards Air Force Base in California at the end of this mission. April 24, 1990: NASA launched the Hubble Space Telescope on space shuttle Discovery (STS-31). Soon after launch, controllers found that the telescope was flawed by a mirror defect only 1/25th the width of a strand of human hair. Scientists found a way to work around it using computer enhancement, and engineers planned a shuttle repair mission to fully correct it. Hubble has made many important astronomical discoveries, including generating images of galaxy M87 and providing evidence of a potentially massive black hole. April 3, 1995: NASA launched the MicroLab 1 mini-satellite on a Pegasus rocket carried aloft by an L-1011 aircraft flying out of Vandenberg Air Force Base in California. The mini-satellite carried meteorological experiments designed to track lightning and to provide detailed temperature and moisture profiles across the globe. Data from this mini-satellite has shown that more than 1.2 billion lightning flashes occur around the world every year, with more lightning strikes occurring over land masses than over the oceans. April 4, 2000: Russia launched Soyuz TM-30 from The Baikonur Cosmodrome in Kazakhstan on the last Soyuz mission to the 14 year-old Mir space station. Cosmonauts Zalyotin and Kaleri reactivated the uninhabited station and used two Progress spacecraft to raise the station's orbit. 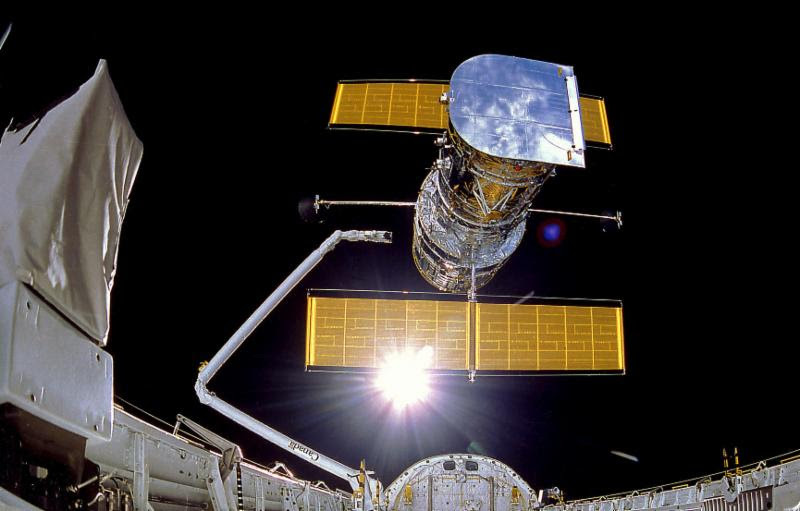 Prior to this mission, Mir's orbital plane was only around 120 degrees away from the International Space Station, making transport between the two stations impossible. April 15, 2005: Russia launched Soyuz-TMA 6 from The Baikonur Cosmodrome in Kazakhstan carrying the Expedition 10 crew to the International Space Station. 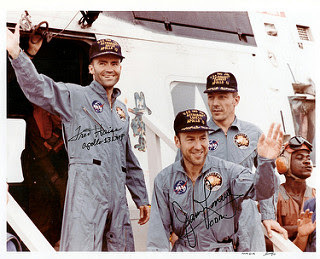 The crew included three astronauts; Sergei Krikalev (Russian), John Phillips (American) and Robert Vittori (Italian.) During the mission, Krikalev broke the record for total time in space. Fifty-four years in March, NASA's Pioneer 4 probe flew within 37,000 miles of the lunar surface. In doing so, the tiny spacecraft flew the first successful American lunar flyby mission. Here are some more current events in Aerospace. Special THANKS to Lt Col Lipman for passing them on. ENJOY! Here's a look at the aviation-themed park that opened Nov. 10. It is a $2.7 million Town Center CID project. There’s a new place to play in Cobb County. An aviation-themed park opened near the Cobb County International Airport-McCollum Field (of course) on Friday. The county approved the park in February. According to organizers, the three-acre Aviation Park cost $2.7 million and was funded by the Town Center Community Improvement District and the Town Center Community Alliance. But how aircraft-inspired are we talking? Well, there’s an airplane-shaped climbing rope web, control tower-themed bathrooms and the picnic pavilion is designed to look like a wing. And the whole thing is located near the end of the airport’s runway, which is why there’s an open area designed to specifically watch planes in flight. To find it, you’ll want to search this address: 2659 Barrett Lakes Blvd., Kennesaw. Another rounds of current Aerospace events courtesy of Lt Col Shelley Rosenbaum Lipman, CAP. F-35 The Future of Warfare. Here is an article on from Business Insider about the new F-35 and what the future of warfare looks like. Wit all the potential pilots we have as cadets, it would be great to see a couple of them go on to fly this incredible plane.